The largest taxi dispatch companies in the world — Uber — has officially launched its services in Lahore, Pakistan. Launch plans were disclosed to media during a pre-launch briefing held today in Lahore. 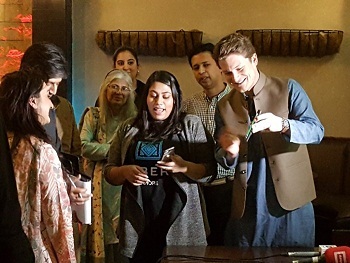 Loic Amado, Uber’s International Launcher for Middle East & Pakistan, and Amna, Uber’s head in Pakistan, revealed the details. According to Loic, Uber has been downloaded by thousands of Pakistanis already. He said that cities choose us, instead of Uber choosing cities. “The interest has been incredible in Lahore, so we are extremely excited to be launching here first. Anyone can now enjoy an affordable, reliable and safe ride at the push of a button thanks to uberGO”, said Loic during his briefing at the event. Uber will be launched in Karachi and Islamabad during next few months. Uber said that its launching the service in Pakistan with a cash as well as the usual electronic payment option – one of the first Uber cities globally to do so. To celebrate, trips throughout Lahore will be free for the first weekend. The first person to try uberGO in Lahore was actress and international model Mehreen Syed. Legendary cricketer Shoaib Akhtar also took a test ride around the city. Loic also explained about some Uber features like ability to share your location with friends in real-time. He also mentioned Uber Pool service that allows 2 or more people to share a single ride and split the fare. Uber has started with 100 riders/cars on-board for services in Lahore. Number is obviously going to grow with time. Uber is currently offering its UberGo vehicles in Pakistan, that include: Suzuki Swifts, Toyota Vitz, Toyota Corollas, Honda Civics or equivalent. More luxurious cars with UberBlack and UberLUX will be offered later.